Just five minutes from Cape Maeda, this clean, cheerful facility is filled with the sounds of happy pooches. 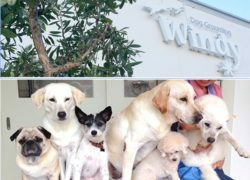 Run by a former veterinary nurse, Windy uses only the best, skin-friendly shampoos and other products on grooming customers from toy poodles to Great Danes, who love the attention. Windy also doubles as a doggie sleepover facility where night lodgings are arranged according to personality. Guests spend the days playing and socializing under careful supervision, allowing their human companions to enjoy a worry-free time away.